In 2015, 36 million people tuned in to watch a championship match, but it was not the World Series or the NBA Finals. It was the streaming final match from the League of Legends World Championship – Esports. For reference, the 2016 NBA finals in which Cleveland took the title drew 31 million viewers. My initial shock at how many people would watch a video game was blotted out by the memory of a photo on my parents’ wall. In the photo I sit, cross-legged and summer tanned, on the floor with my brother and two of my cousins. Our arms are around each other, but each of the four of us has one hand on the controller from a Nintendo 64. We had just beaten a new game, and we were proud. Though some of us had more time with fingers on the buttons than others, all four of us had sat there, strategized, shouted advice, thrown ourselves down on the floor in dismay, and jumped up and cheered. It was by no means a lonely memory. It was closer to being in a football stadium than sitting at a computer. It felt like a team sport. The digital gaming landscape exists in the crossover between recreation and competition that encompasses most sports. Players train, interact, take on task-specific challenges, communicate, collaborate, and ultimately try to win – but in an engrossing, virtual environment. There are goals and rules, spectators, skills, and human competitors. There are long-established teams, and there are matches where partnerships are set by the computer and only last the length of a game. Participation also ranges from professional to amateur, like the NBA down to the backyard basketball hoop. And participation is growing. As the average age for viewers of live sports gets older, investors and media companies are turning to what young people are watching. According to MarketWatch, Esports will reach and estimated 427 million viewers by 2019, with 73% of those viewers below the age of 35. NFL owners are buying Esports franchises. As the Esports landscape grows, so do the opportunities within it – and not just for the players themselves. The North American Scholastic Esports Federation (NASEF) is opening the Esports arena to the high school crowd, creating new opportunities for growth, teamwork, and mentorship. NASEF started in Orange County as a pilot collaboration between the Samueli Foundation and Dr. Constance Steinkuehler, a professor of informatics at UC Irvine who studies thinking and reasoning related to video games. Steikuehler and Gerald Solomon, executive director of the foundation, met at UCI and wondered what a crossover between STEM initiatives and gaming research might look like. Steinkuehler’s lab had focused on the commercial realm, but their insights into the role of productive failure in learning, optimizing teams, and player behavior formed a natural extension into educational settings. The schools that formed teams ran them to the same standards as any other team, requiring certain attendance levels and grades to compete. Teams trained, and victory became a point for school pride. Unlike the stereotype of gamers as isolated people sitting at computers in the dark, Steinkuehler described the federation as a complex ecosystem. “Thinking about Esports as just the gamers is like thinking about the NBA as just the players,” Steinkuehler said. There are players, coaches, managers, sponsors, marketing, shoutcasters, and event planners. There are also the fans. Roles within NASEF involve students and mentors at a range of ages. While General Managers are typically adults – like teachers or leaders of community-based organizations – coaches are college students who can serve as near-peer mentors. They are trained on how to incorporate mentorship so that they can advise on gameplay as well as guide social-emotional growth for the students. Students make up the teams, take on marketing, social media, IT support, event-planning, and other components that will serve as useful experiences in future professional markets. And with colleges starting to offer Esports scholarships, the players have additional external motivation as well. 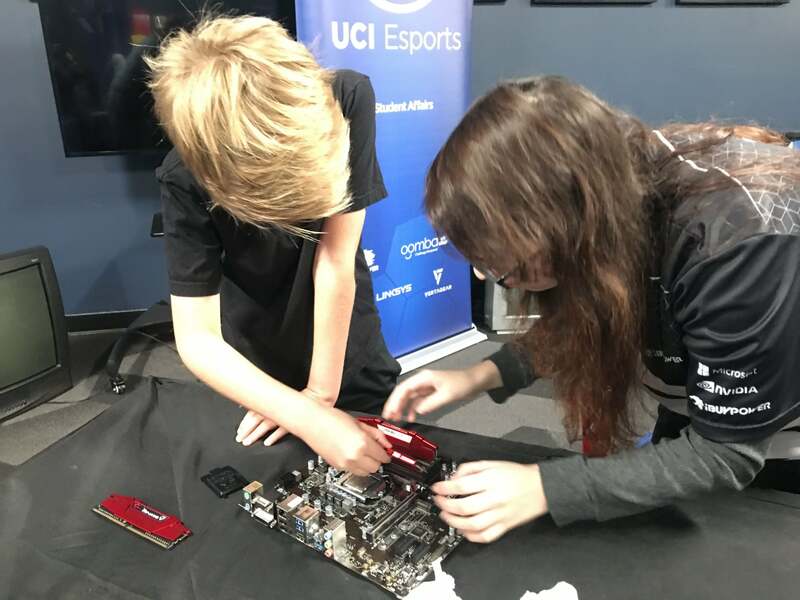 Though Esports may be a new venture for the Samueli Foundation, they have an established presence in STEM programming. Given the student enthusiasm, presenting information and tasks in an Esports context provided a chance to meet the students where they were. Steinkuehler mentioned that using scientific literature about game performance, like studies about non-verbal communication and declines in individual performance over time, let students engage in a data science problem in a way that could be applied to their own performance. The use of computers provides natural extensions into technology fields. Creating a language arts curriculum that teaches marketing skills in the context of Esports provides another chance for connections. Gaming provides an excellent platform to see the value of learning through failing and develop resilience to perceived setbacks. Researchers have even studied the ways that emotional and esteem support can be built and provided in a gaming setting. Both Steinkuehler and Solomon said that they had no desire to invade the recreational space that young people had created for themselves – nothing destroys enthusiasm for a youth landscape like adults trying to intervene. But they recognize that Esports is a growing ecosystem that has many young people enthusiastic and motivated. By investing in their skills, facilitating a rich and supported landscape, and recognizing the potential for future growth, federations like NASEF can help to create opportunities for support and mentorship to meet kids where they already are, bringing academic skills and mentorship opportunities along the way.